Over the years, the Book of Common Prayer has attracted a number of printers and engravers to produce “fancy”, often richly decorated volumes, to appeal to wealthy customers. This volume here was the first of these, being engraved by John Sturt in 1717. John Sturt (1658-1730) was a well-known engraver of the time, and this volume was his masterpiece. There is no actual “printing” of text - the entire book, including the text, was engraved by hand on 188 silver plates, which allowed extreme detail to be recorded. The entire project took three years to complete and was financed by the sale of advance subscriptions (very common in those times); the names of the subscribers are listed in the book. The book is surprisingly small - 20cm or 8" tall, and only 188 pages - and the text is correspondingly also very small, and requires a magnifying lens (or very sharp eyesight) to read clearly. 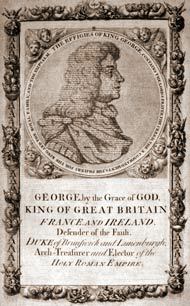 The copy used here is imperfect, the primary defect being that the title page has been cut out and so is missing; this page also contains on its reverse a bust of King George I with various prayers engraved microscopically on it. 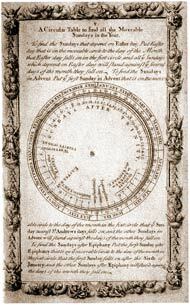 Additionally, the volvelle, a circular dial used to find Sundays, is missing (a fairly common occurrence). Reproductions of these missing pages from other sources appear at right. This particular volume also is “red-ruled”. This means that the purchaser of the book had someone mark off the margins and various sections of the text with lines using red ink. The red-ruling seen here is a typical example of this practice, common in the 1700’s among wealthier customers. Because none of this book is typeset and it consists entirely of engravings, it is presented here as a set of eleven PDF (Adobe Acrobat) graphics files. Also, because of the very fine detail in the engravings, we have scanned it at 400 dpi, so as to hopefully capture all this detail. The files are therefore fairly large, around 15MB each, and may take a while to download. Once downloaded, it is recommended that you view the pages at at least 200% magnification. 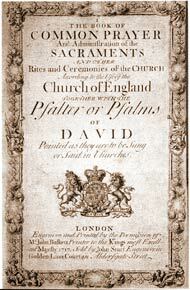 This book appears to be 1717/2 in David Griffiths' Bibliography of the Book of Common Prayer. Front Matter: Preface; Of Ceremonies; Tables; Kalendar; List of Subscribers; etc. Part 1: Morning Prayer; Evening Prayer; Athanasian Creed; Litany; Prayers & Thanksgivings. Part 2: Collects, Epistles & Gospels, 1 Advent to 5 Lent. Part 5: Collects, Epistles & Gospels, 19 Trinity to end.